Cady Sinclair is living a life of luxury. She is a part of an extremely wealthy family, the kind where you all spend the summer on your own private island with multiple homes and a staff that caters to your every need. But this summer feels different. Cady had an accident two summers ago and everything is strange to her now. Her family seems aloof and they treat Cady with kids gloves. Her grandfather's beloved home has been torn down and replaced with a cold marvel of modern architecture. Worst of all, Cady is crippled by terrible migraines and can't quite remember what happened two summers ago. Cady spends her time with three of her best friends - her cousins Mirren and Johnny and their friend Gat. While Mirren and Johnny take advantage of the same wealth that Cady does, Gat is an outsider and perhaps the only one who realizes the immense privilege that the Sinclairs enjoy. It is this bravery to speak the truth about all situations that attracts Cady to Gat and they begin a tortured teen romance. Gat has a girlfriend at home and Cady's grandfather decidedly does not approve of him for his beloved granddaughter. But the foursome functions best as a group, as they take part in time-honored teen activities like sleeping in, sunning and swimming, and availing themselves of the family wine collection. These four friends don't see each other during the school year, but the summer belongs to them. 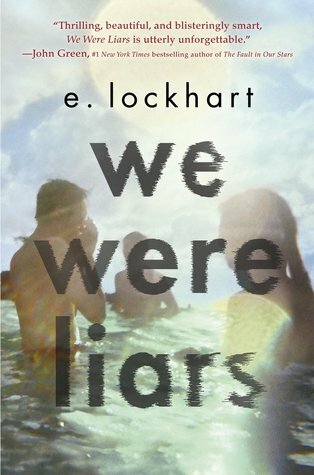 We Were Liars is poised to be the "it book" of the summer. Like Gone Girl before it, readers are pushing this one into their friend's hands with the warning that the ending will take them totally by surprise. This book is shrouded in some heavy secrecy. With kudos to readers for managing to keep the ending under wraps, I think this is one of those situations where all of the hype is damaging. The twist is indeed a good one. But this story is better if the big reveal is unexpected and hits you square in the stomach instead of you wondering if each chapter will be the one to disclose the big twist. This story actually has quite a bit to say about privilege and the way that we perceive people. Cady tells the readers over and over again that they are Sinclairs. That means something, both to the members of the family and to the people they encounter. Cady even imagines her family as characters in various fairy tales as she struggles to figure out what has changed in her family and who has done the changing. The Sinclairs have carefully created perfect personas that hide the uglier underside of their lives. Everyone serves at the whims of Cady's grandfather, the family patriarch. His daughters are eager to appease him and inherit the majority of the family fortune, even if that means controlling their children so they appear exactly the way their grandfather would like to see them. Lockhart's writing style in this book is unique. Cady is a teenager and prone to hyperbole and exaggeration. She explains her recollections and observations in broken prose that sometimes resemble poetry. She is also prone to characterize feelings as though they were events. For example, early in the story, her father leaves their family. She remembers her father getting into his car and then "he pulled out a handgun and shot me in the chest. I was standing on the lawn and I fell. The bullet hole opened wide and my heart rolled out of my rib cage and down into a flower bed." It takes the reader a moment to realize that these things didn't actually happen - Cady is conflating her feelings to actual injury. We Were Liars is a story about breaking away from your family. It's about the moments when you realize your loved ones are not as perfect as you had always thought them to be. This book will make you think about the darker side of privilege and power and what exactly we pass on to our children and grandchildren. And yes, the ending will make you reevaluate everything you thought you knew about Cady and the Sinclairs. After all, she tells us, we were liars. I'm so excited for this one! It keeps popping up everywhere, and the praise has been almost unanimous! Yet here I am, withering pathetically on the wait list at my library, 9th in line. I'll get it eventually I suppose! Waiting in the queue at the library always seems to take forever! And then, of course, three books come in all at once! I like how your review was very unbiased and detailed, but at the same time gave very little away. I'm kind of on the fence about We Were Liars. I enjoyed it, but I wasn't incredibly overwhelmed by it - the twist was quite a hitter though, I was surprised. Thanks Jade! It can make writing reviews complicated when you don't want to give too much away. I enjoyed it as well, but I don't think it's going to be my favorite book of the summer! I loved this one (which really surprised me more than the "twist"). I think I read it on the front end of the hype, so that was also probably a good thing. That is usually a good thing! It's tough to look at a book objectively when you have heard so much about it. I enjoyed this one, too - I listened on audio. I totally agree that overhyping can ruin a book, especially when the hype tells you there is a big twist coming. I rarely get to hot books while they are still hot, but I'm glad I listened to this one early! Audiobook is an interesting choice! I bet the narration really added something to this story. This book has been on my radar for quite some time, but I haven't gotten around to reading it yet. Your review definitely helped to give me a little push in the right direction though! I've been looking forward to reading this book but I'm not sure about the quote you shared. Cady just sounds so melodramatic! I'm hopeful I'll enjoy it for the mystery anyway though.